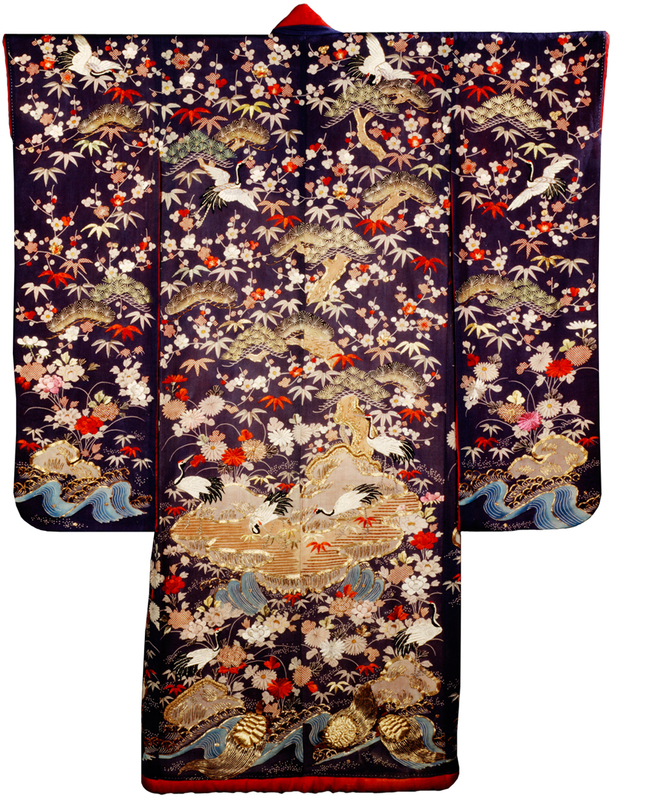 This kimono has a lavish overall design of auspicious motifs of pine, bamboo, plum, peony, chrysanthemum, crane and tortoise. 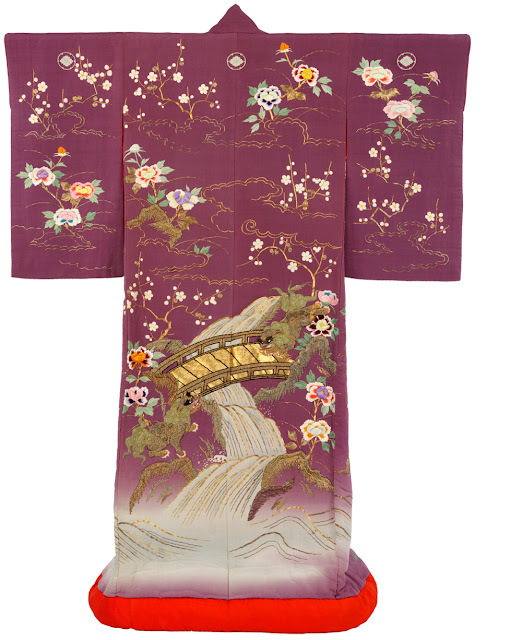 This type of kimono was often exported to the West in the late 19th century in respose to the craze in Europe and America for all things Japanese. 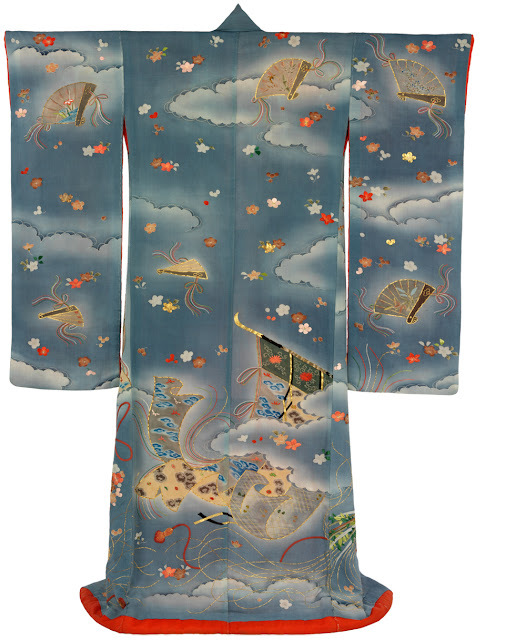 This kimono is embroidered with two shishi, mythical lion-like creatures characterised by their fierce expressions, large eyes and curly mane and tail. They are shown fighting across a bridge over a waterfall surrounded by peonies. The eyes of the shishi are of glass and the embroidery is padded, giving the scene a very three-dimensional quality. The thick, heavy hem of the garment denotes that it is an outer kimono, or uchikake, worn during the winter months. Uchikake are worn without an obi (sash) so the rich design would have been clearly visible. This elegantly patterned kimono celebrates the beauty of textiles through its decoration, which depicts lengths of fabric hung on an elaborate stand and gently fluttering in the breeze surrounded by clouds, fans and falling cherry blossoms. The design was created using a technique called yuzen. This involves drawing the pattern on the cloth with rice paste extruded through the metal tip of a cloth bag. The paste forms a protective coat that prevents the colour penetrating when the dyes are applied. Here the skills of the dyer have been enhanced by those of the embroider, who has highlighted the stand and the edges of the fabrics in gold and added flowers, blossoms and elaborate ties and tassels in pink, white and green.